When it comes to holding court in NHL outdoor games, it’s good to be the King. This past week, for the second time in four days, Henrik Lundqvist netted a win at Yankee Stadium, earning a 2-1 win over the New York Islanders on a frigid (-5.6 Celsius at puck drop) Wednesday evening at the historic ballpark. With the victory, Lundqvist, who’ll represent Team Sweden at the upcoming Winter Olympics in Sochi, took sole possession in the most wins (three) in NHL outdoor games category, breaking a deadlock with Ty Conklin. Lundqvist has a 2.00 goals-against average and .933 save percentage in his three outdoor appearances, a 3-2 win over Philadelphia in 2012, coupled with a 7-3 triumph over New Jersey on Sunday and his Wednesday win. And so did the goalie known as King Henrik. 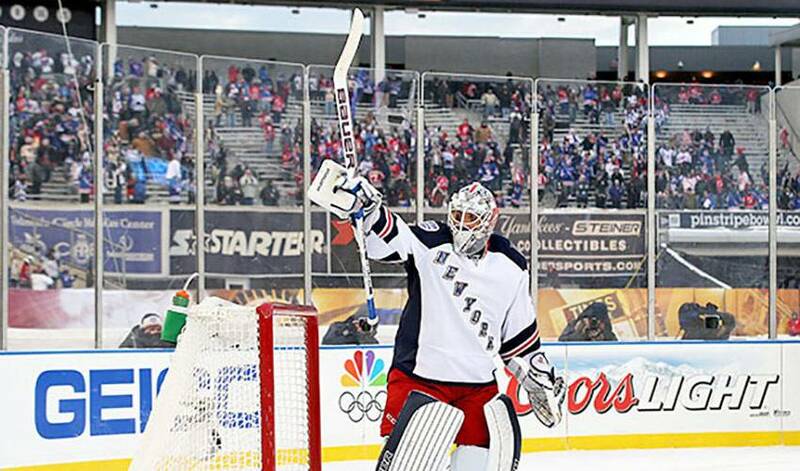 “It was a little cold, but it was awesome again,” said Lundqvist. “Little different type of game tonight. I thought we played really smart. We just kept making really good decisions without the puck and that kind of won us the game, I think. Not surprisingly, talk turned to the Olympics after the Rangers victory. Lundqvist, who helped lead Sweden to gold at the 2006 Winter Games in Turin, is hoping for a similar story in Sochi. A king-sized task, but one that Henrik Lundqvist is always up for.